Though they can occur during any season, equine hives, or urticaria is a common problem with horses during the summer months. Hives present as circular wheals covering large areas of the body. They are sometimes accompanied by itching. Hives are a sign of disease, not a specific disease itself. There are both immunologic and non-immunologic causes of hives. Most are immunologic. Non-immunologic causes include pressure on skin, sunlight, heat, cold, exercise, stress, and genetics. Immunologic causes include insect bite hypersensitivity caused by stable flies, mosquitoes, culicoides (biting midges), horse flies, and chiggers. (Follow link for more information on insect related health concerns) Also included are atopic dermatitis, food allergies, drug reactions, dewormers, antibiotics, vaccines, various medications, vitamins, and supplements. Bacteria, virus, fungus, protozoa and parasites can also trigger hives. Sometimes contact with a substance or material such as a fly spray or bedding may cause hives. There are so many possibilities that finding the cause is often difficult. It is helpful to note if any product or care changes precipitated the hives. Removing potential elements one at a time and waiting a minimum of 1 - 2 weeks to see a difference is a time consuming and unrewarding method of determination. Intradermal skin testing is the gold standard for identifying allergens to be included in immunotherapy vaccines for horses. This is done very similar to allergy testing in humans. Hyposensitization based on intradermal skin testing has a 60 - 70% good to excellent rating in horses completing the treatment. 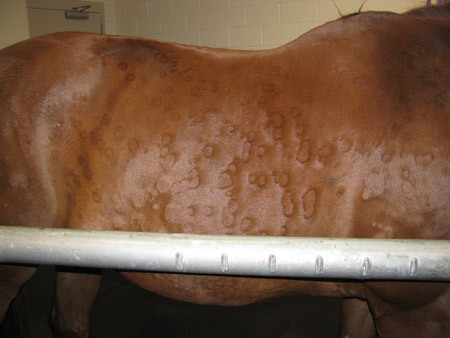 Chronic recurring urticaria is the most common in horses. The most frequently occurring lesion is a wheal, a flat topped nodule with steep walled sides caused by edema in the dermis. They may be a few millimeters to several centimeters in diameter. Each lesion lasts 24 - 48 hours. Lesions can occur anywhere but are most common on neck, trunk, and legs. Angioedema is a more diffuse edema involving subcutaneous tissues. It usually involves the head and neck and extremities. This signifies a much more serious disease. Angioedema is rare but can be life threatening. Call your veterinarian right away if your horse starts to develop any signs of an allergic reaction such as hives. Your horse can be diagnosed and a specific treatment plan established. Call Conley and Koontz Equine Hospital if we may be of service.